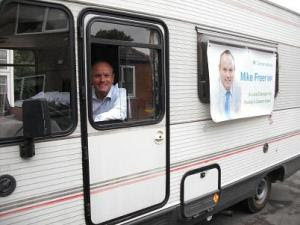 Whilst most MP's expect their constituents to come to them, Mike is going to meet the people. We've raised money to buy Mike a battle bus so he can hold his constituency surgeries in places convenient to his constituents. MP's in rural areas have been doing this for years, but we believe it is a first for a London MP.